The RapiSand Plus package treatment plant provides both clarification and filtration within a single tank. 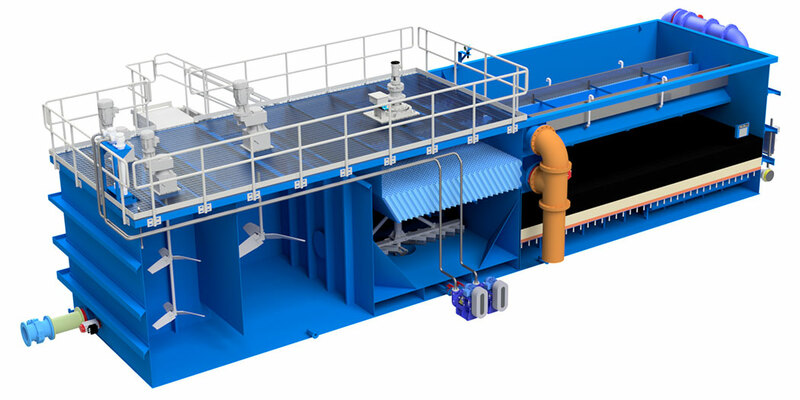 It is designed to meet customer demands for a compact, low cost, high-performance system capable of treating high-solids and high-color influents to produce high-quality effluents. Because both the clarification and filtration processes are from a single provider, it also meets the need for flawless integration between processes. RapiSand Plus’s two-stage system is simple and versatile. The ballasted flocculation system in the first stage mixes coagulated raw water with microsand to create a ballasted floc that settles rapidly. The mixed-media filter in the second stage removes turbidity, remaining suspended solids, color, iron, and manganese to produce a high-quality effluent. “The RapiSand Plus water treatment plant is the most advanced product of its kind because it combines the ballasted flocculation technology from our RapiSand clarifier, which clarifies flashy waters of up to 1,000 NTU turbidity, with the mixed media filter technology from our Trident® package plants, producing up to 1,400 gallons per minute of high-quality drinking effluent,” explains WesTech Product Manager Jayme Tuomala. This innovative all-in-one treatment plant is an ideal choice for customers with tight space constraints. The RapiSand Plus fits into a standard-sized building, making it comparatively easy to install. It also offers quick start-up times, reaching steady-state operation in as little as 15 minutes from power-up. Additionally, it delivers high performance while saving on installation and operations-energy costs. These benefits make the RapiSand Plus a cost-effective choice for municipal and industrial applications. See WesTech’s other package water and wastewater treatment plant offerings by scrolling to the Package Treatment Plants categories on our Product Listing page.